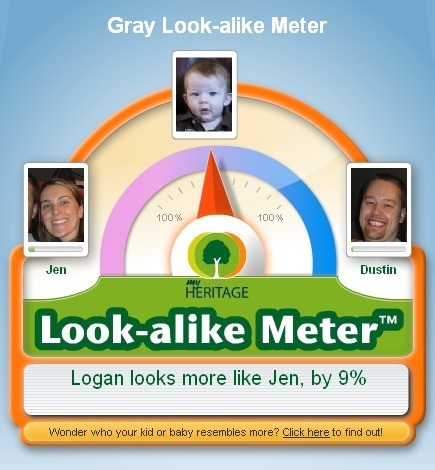 Finally - some random website that also agrees that Logan looks more like Jen! Of course we all knew Zach looks like Dustin! 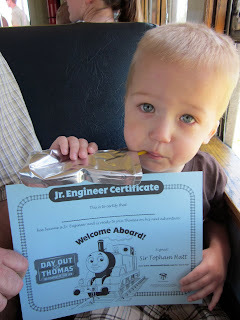 Today we took the kids and Glen out to Heber City Utah for "Day out with Thomas". Zach always has loved trains and we figured this would be a great time from him to actually RIDE one! He has a few Thomas the Train DVDs which he does like to watch....so why not?! The weather turned out BEAUTIFUL - the drive up the mouth of the Provo canyon was picture perfect. Zach has been fighting naps this past week - so of course FIVE MINUTES before we arrived to the train station he fell asleep. We packed him up and decided to start our adventure anyways. After about 20 minutes of getting our train tickets and scoping out the activities - Zach finally woke up (and in a GOOD mood!). We decided he would love the tattoo booth the best and went there first. Both Zach and Dustin got Thomas the train tattoos on their arms! Next stop - the "interactive" booth. Zach just stared at the trains. Didn't really trying to play with them - just watched them. Then Thomas came rolling back into the station; we had to go show Zach Thomas the train (he had not physically seen him since he woke up from his short nap). Now it was OUR TURN to get a ride from Thomas the train! We let Zach pick out where we would sit. Zach was very excited to have his Grandpa Gray join us for the train ride. ...but we were able to bring the smiles back! Our train ride was done and it was time to do some more exploring. Zach checked out the tracks, an ambulance, and of course the gift shop. This is when it started becoming apparent Zach NEEDED a longer nap. Our two year old was acting like a two year old and it probably didn't help we were all suffering from allergies. So we decided it was time to head back home. On our way back to the car we saw a helicopter fly by! Now our kids (and US!) can brag about their day out with Thomas the train! 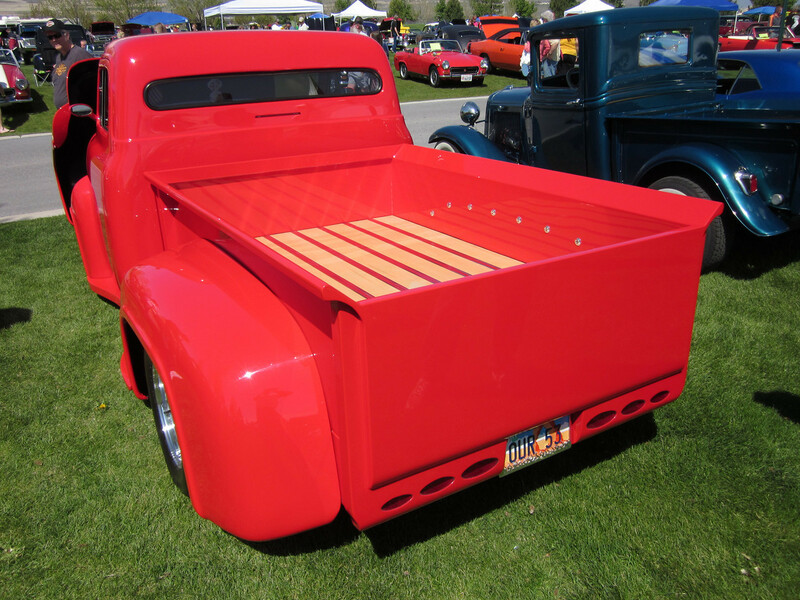 Check out the progress on the 1958 Chevy Pickup Restoration! Logan is 5 months old! Seriously - where does the time go? Logan is already FIVE MONTHS OLD?!? As you can see from the picture above he is cuter than ever and has amazingly beautiful blue eyes. 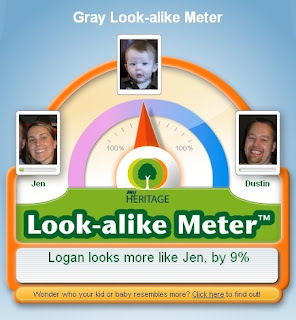 He doesn't look like Zach and everyone says Zach looks like Dustin - so that means Logan looks like Jen...right?! Logan loves to use his voice. He talks to us quite often. He loves to fly like superman and dance and of course watch his big brother Zach. In size 3 diapers, size 6-9 month clothes, drinks 5 oz bottles every 4 hours...and still doesn't sleep through the night (big frown on mommy and daddy's faces!). Jen's good friend Stephanie Brown-Nicholes was in town this week all the way from GERMANY! 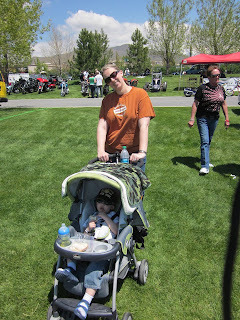 It was an unexpected trip - her husbands grandfather passed away and they had the funeral to attend this week in Utah. Jen and Stephanie have been friends since high school and have kept in contact through out all these years. Stephanie's family lives in South Jordan and during our college years (since we both attended in Utah) we were able to hang out quite a bit. We made any excuse we could to have a "noche de chicas" - which basically was pizza, ice cream and a chick flick. 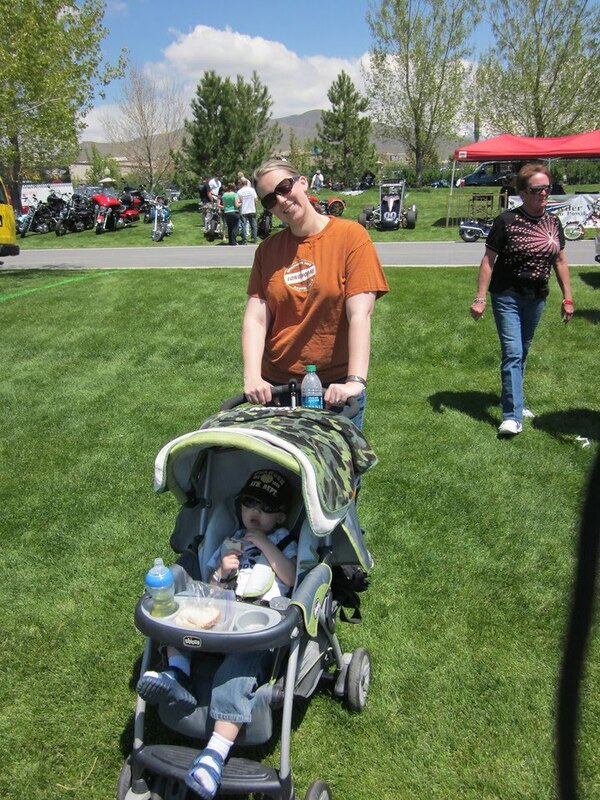 Stephanie had her first child 26 days after Logan was born. Tonight we got to meet little Elijah for the FIRST TIME (he is 4 months old).....I guess this mean us adults are all grown up now! Logan loved hanging out with Elijah - we determined that Logan is going to be a bully when he grows up. Look at him sucker punch Elijah. He kept going for the eyes! We were happy to spend any time we could steal from the Nicholes (an hour) on their short unexpected trip. 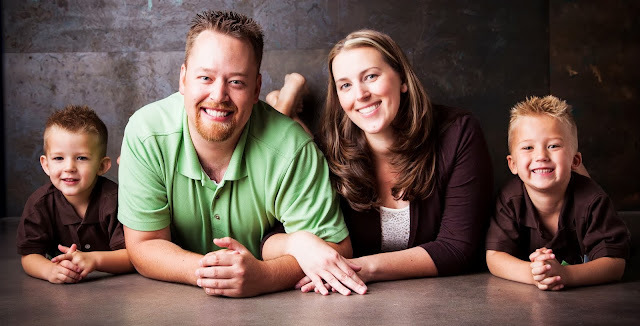 We are looking forward to them moving back to the USA to the great state of California in August of this year (Stephanie's husband is in the Air Force). This has been happening quite a bit around our house! Zach is LOVES to give Logan kisses and hugs. Now how is it possible that it looked like THIS today outside? I think we skipped the end of spring and all of summer. The snow (a good solid inch!) 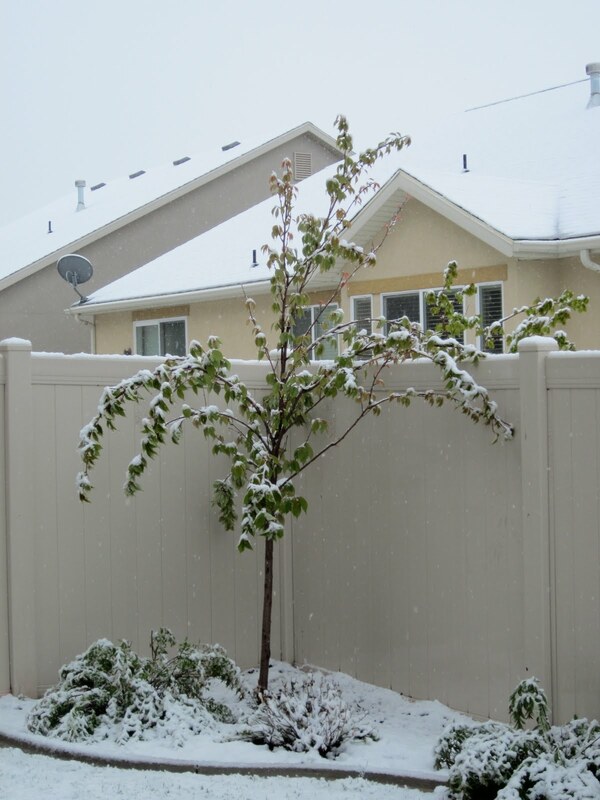 was all melted by the end of the day -- but our lovely 2 week old flowers and vegetable garden may be toast. This weather didn't slow down the birds!! 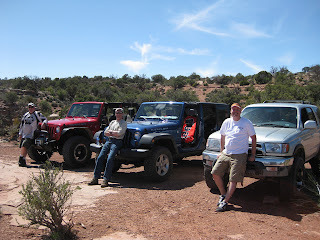 On Saturday Cliff Maag and I set off for Moab UT for a bit of 4x4 fun! We met up with Steve Morey and his wife Coral as well as their friends Steve and Karen Byrne. We've been going a few times a year since we moved here.. Its an absolute rush. 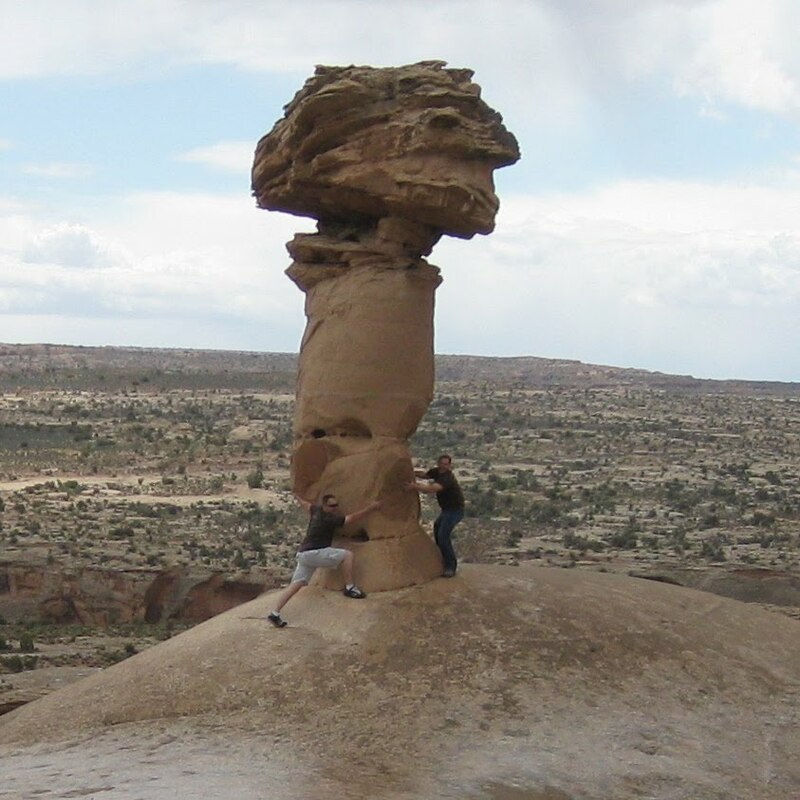 If you've never been there before, and you live in Utah.. You need to go.. 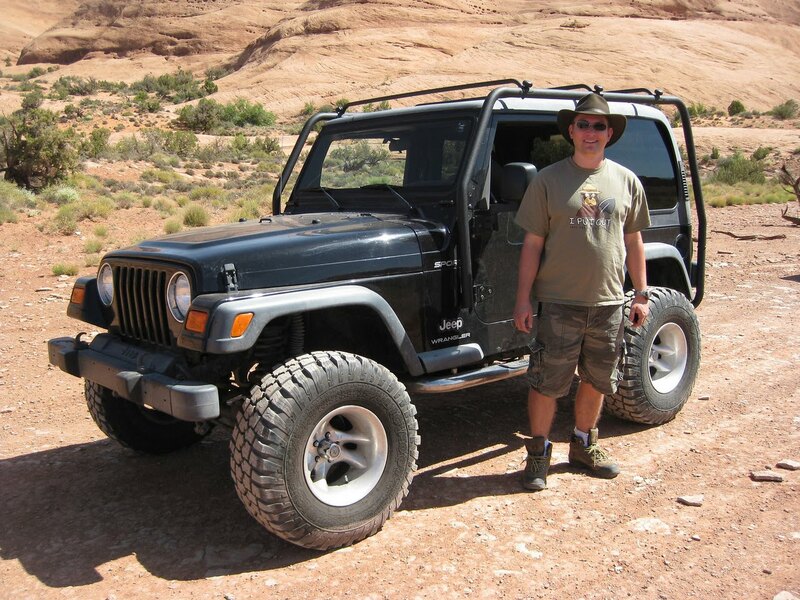 Rent yourself a jeep if you have to when you get there.. but do it! We ate lunch here at this natural arch. It was absolutely amazing. 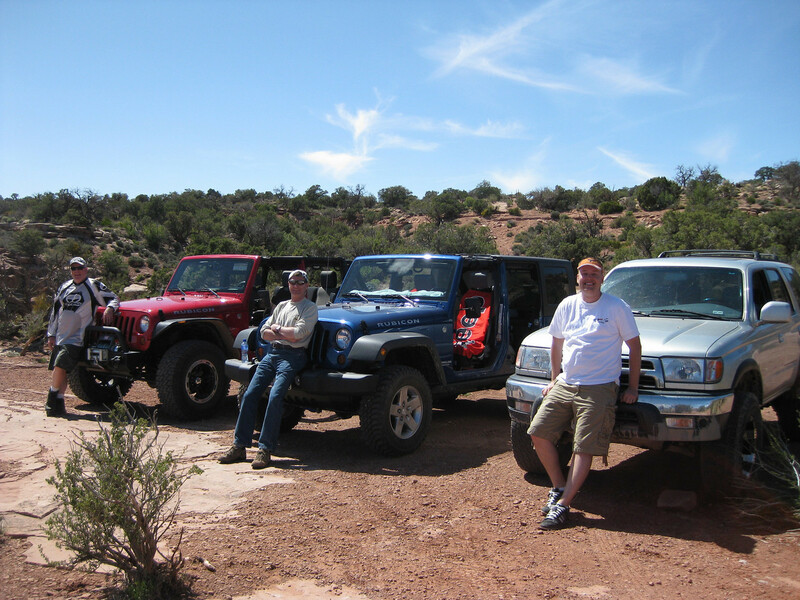 Steve Morey, Steve Byrne, and myself hanging out by our rides..
Overlooking the Dome Plateau fisher towers view point.. About 10 feet in front of us was a nasty drop.. probably a 500 or 600 feet drop.. Pretty crazy. 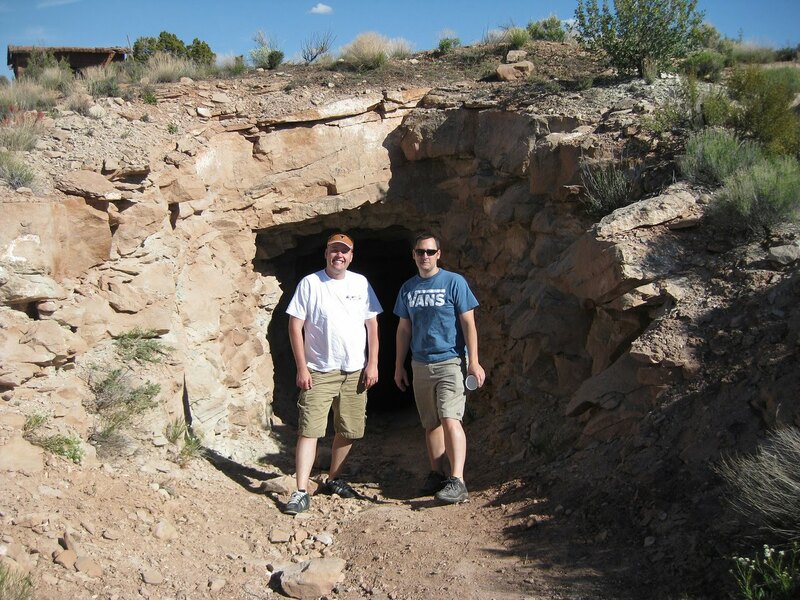 We even came across an old abandoned mine! We went inside and explored a bit.. until Steve Byrne freaked us out by banging a wire on the side of the mine entrance.. I'm not a fan of dark creepy places especially when you can't see the end of it.. I won't sugar coat it.... We ran. 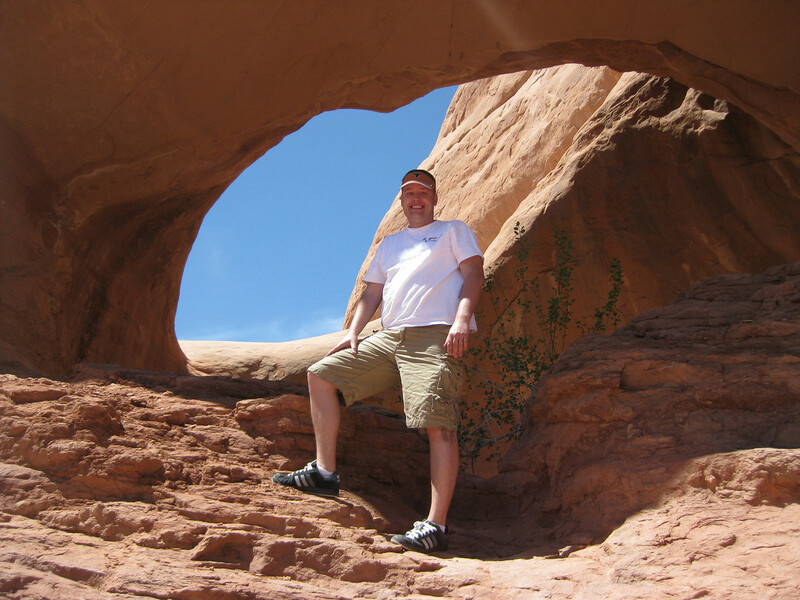 The second day, Dave Towner joined up with us. 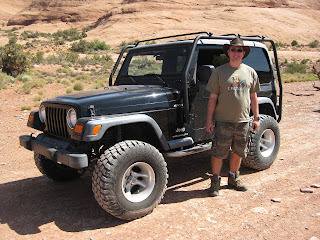 We decided to take his jeep for the day, especially since we were heading for a pretty gnarly trail which would have been tough if not impossible for the 4 runner due to the long front end (not so good for tight corners and steep climbs). 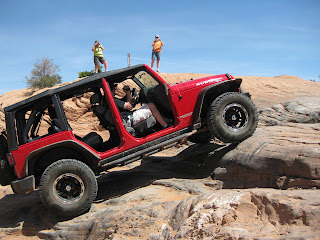 Dave's jeep did really well on the rock.. Its amazing what a jeep can do. I want one. Steve made rock climbing in his new rubicon look easy. See that over there? Watch me climb over it.. lol. I want one. This is the overlook from Poison Spider. 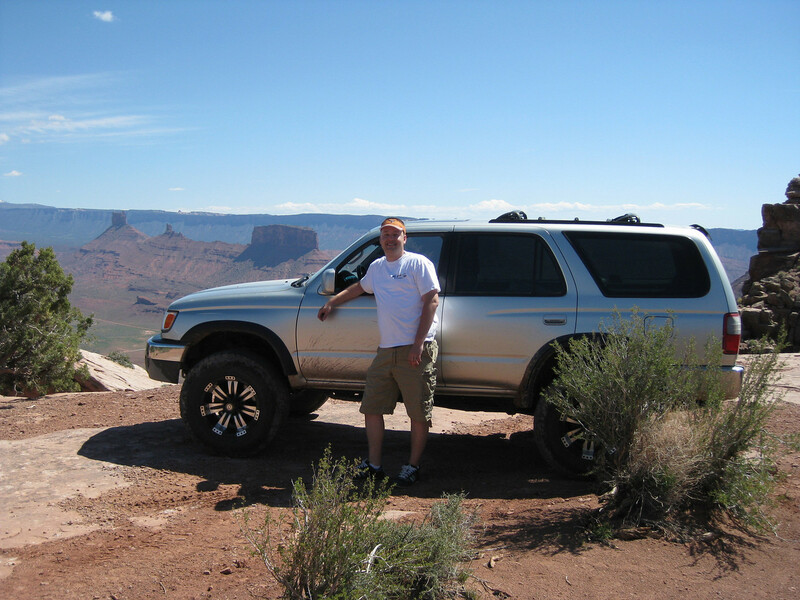 From here we could see the city of Moab! Our last day it rained on and off.. 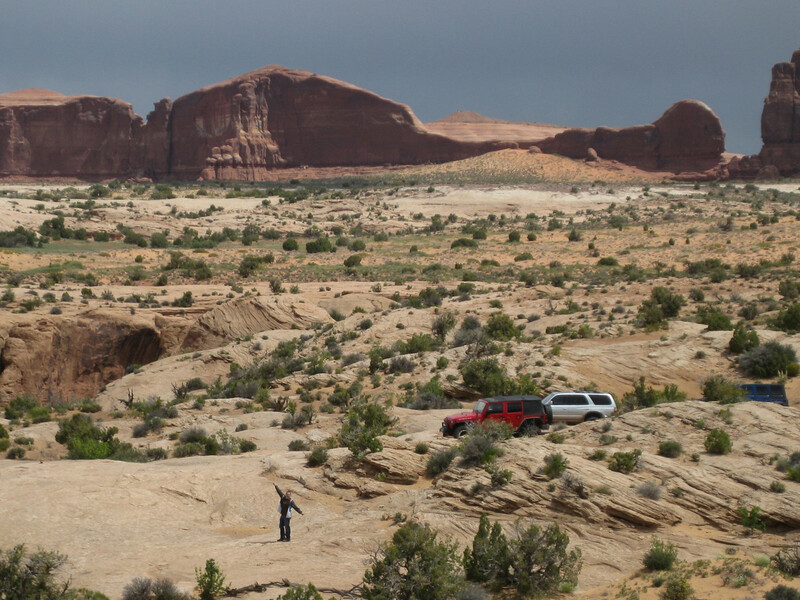 Which was fine because we weren't doing serious 4x4 climbing.. Just exploring. We found a cool cave, a canyon, and a few neat rock formations.. and of course we collected some mud on the trucks! 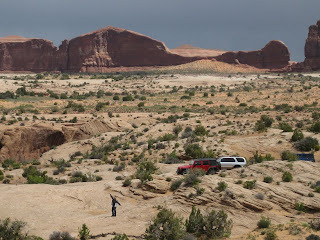 This was one of the overlooks near the cave and canyon we found.. Can you see Cliff? This is hidden spire.. We tried, but just couldn't push the sucker over. Yes we're still just a bunch of kids. 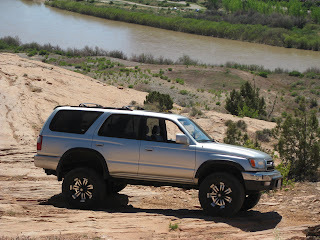 I don't care what people say about going to Moab in anything but a jeep, even though the Jeeps did awesome on the trip (I still want one), our Toyota 4 runner still performed like a champ. 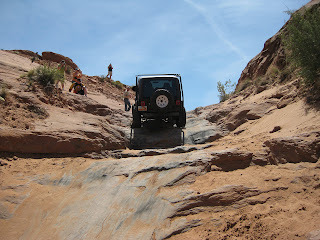 I was able to go everywhere the jeeps went and had a lot of fun in the process. And Jen was grinning ear to ear when I made it back with no body damage on Zeus! I have to say.. 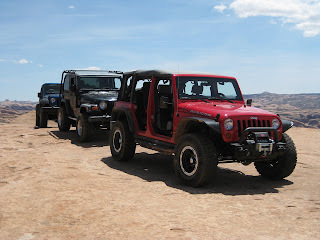 I'm already looking forward to our next trip to Moab! Red rocks are addictive! Dustin has spent the last few days in Moab - 4 wheeling with the guys. 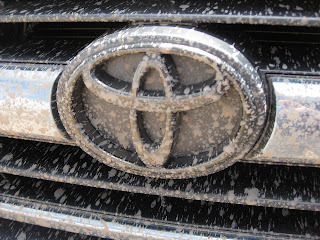 Until he blogs about his 4 day adventure...Jen created this tribute video to the 4runner. 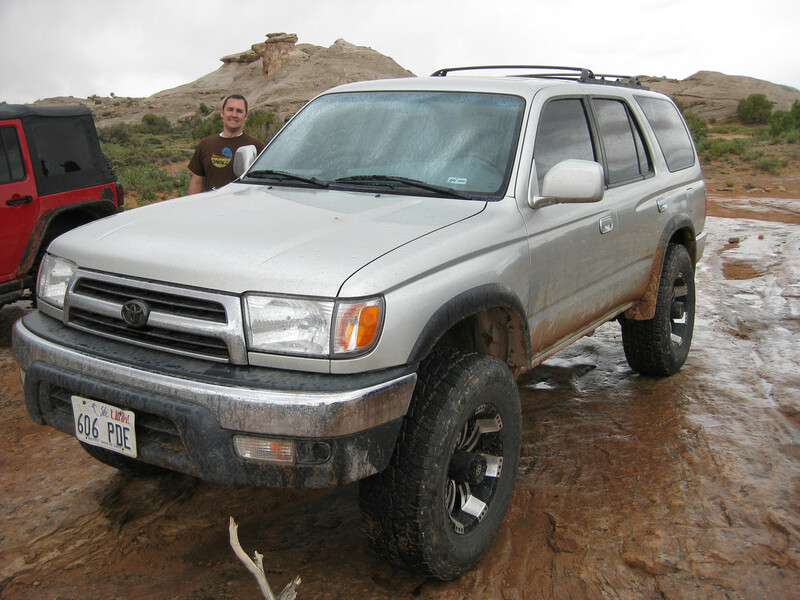 Basically what she thought was "cool" from the film captured (4runner specific). 1 box of Cheerios: full price $2.99, Smiths sale made it $2, Jen had a 55 cent coupon and with the double that made the box of cereal only $1! Same deal with the boxes of Cinnamon Toast Crunch - $1 each after sale and coupons. Flipz Chocolate Covered Pretzels: full price $1.99, Smiths sale made it $1, Jen had a 50 cent coupon and with the double that made the pretzels FREE! Au Gratin Potatoes: full price $1.99, Smiths sale made it $1, Jen had a 40 cent coupon and with the double that made the potatoes FREE! Gum: fully price $1.49, Smiths sale made it $1, Jen had a 50 cent coupon and with the double that made the gum FREE! Cans of frosting: full price $2.09, Smiths sale made it $1.49, each can of frosting had an instant 25 cent coupon on it so with the double that made them 49 cents EACH! I bought four. So if I was to walk into the store and pay full price for all of this it would have been $23.20. With the sale already happening in Smiths that made all of the above come to $14.96. Now add the double coupon special at Smiths and my grand total came to $4.96!!! If I had been couponing longer I could have done more damage with that doubling deal going on at Smiths! 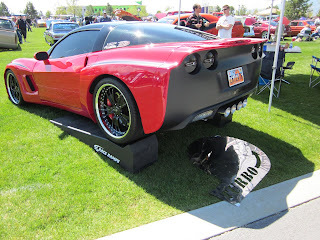 We went to a car show this weekend.. Here are the highlights.. When we got to the park Zach and Grandpa lead the way. 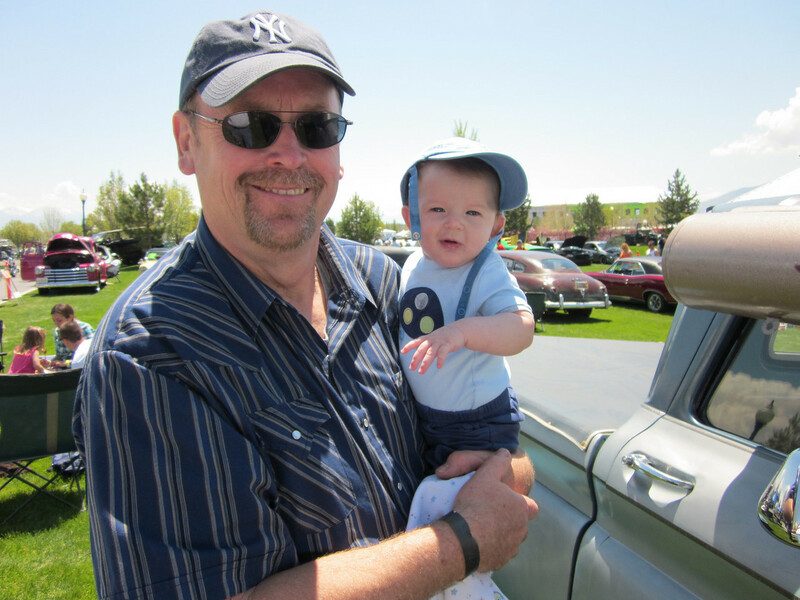 Zach would point at the cars he liked and Grandpa would walk over with him to check it out. 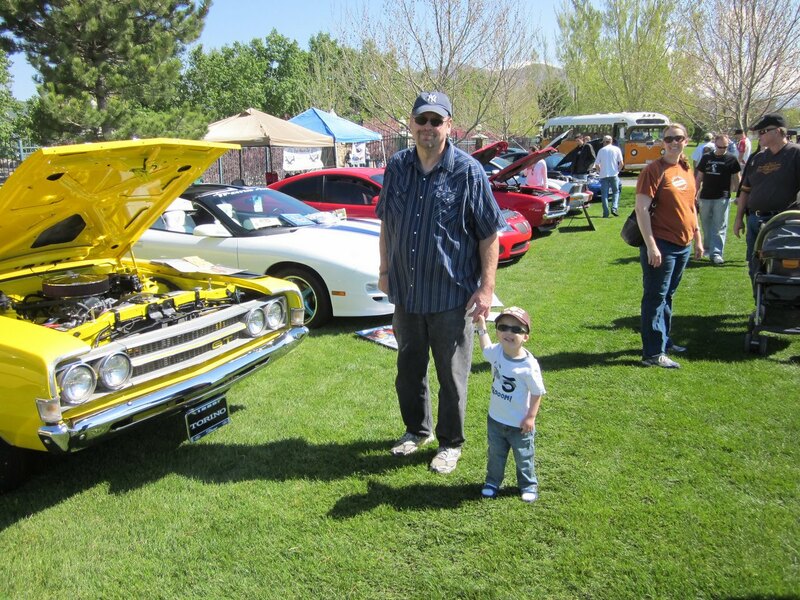 They both really enjoyed looking at all of the neat cars. This was a sweet looking truck.. I loved the chopped top and windows. Go USA!!! 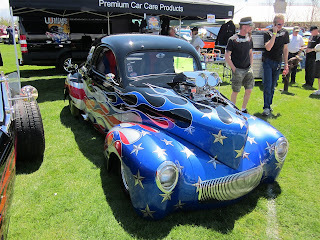 This had to be one seriously expensive paint job.. but it was awesome. Zach decided that Logan's cool ride was too hard to resist.. so out went Logan, and in went Zach! 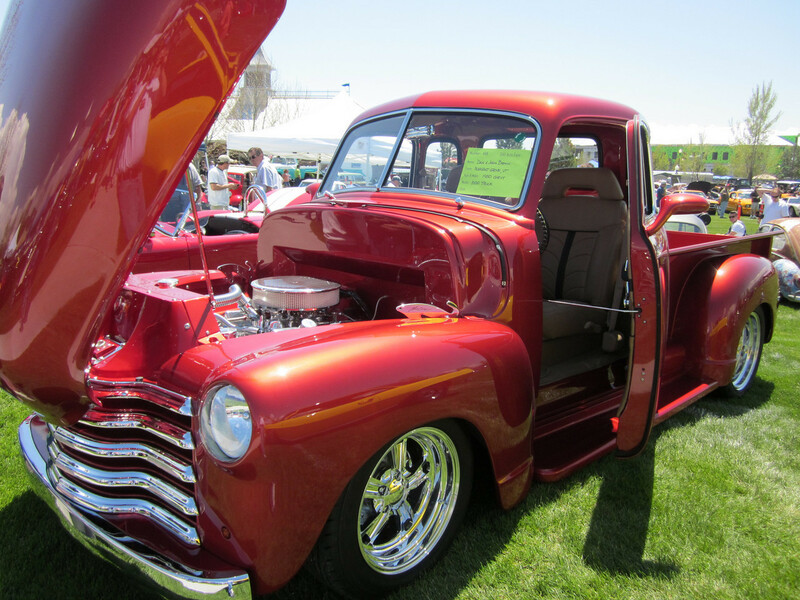 This is a '55.. with some nice work done on it.. 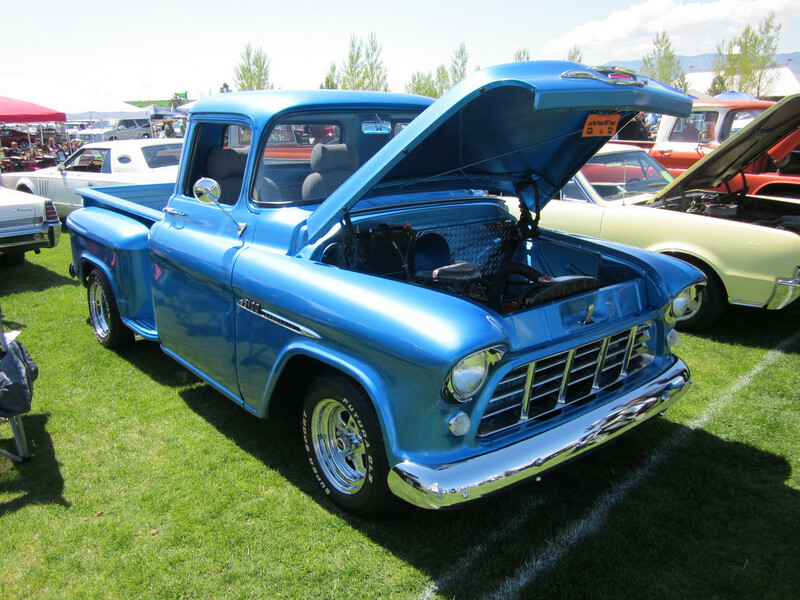 It was the only truck at the show similar to what we're doing with my Dad's '58. 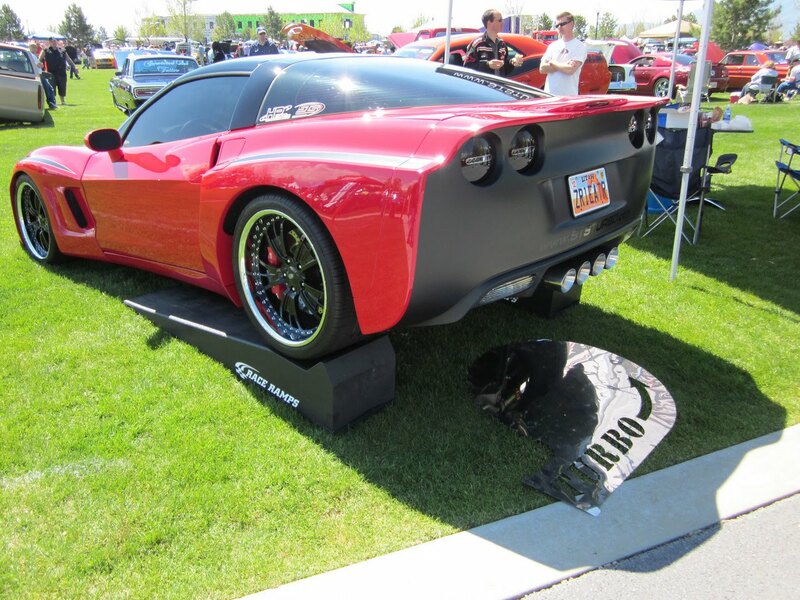 This corvette was freaking awesome.. It had 4 pipes hanging out the back.. Looked pretty fast. 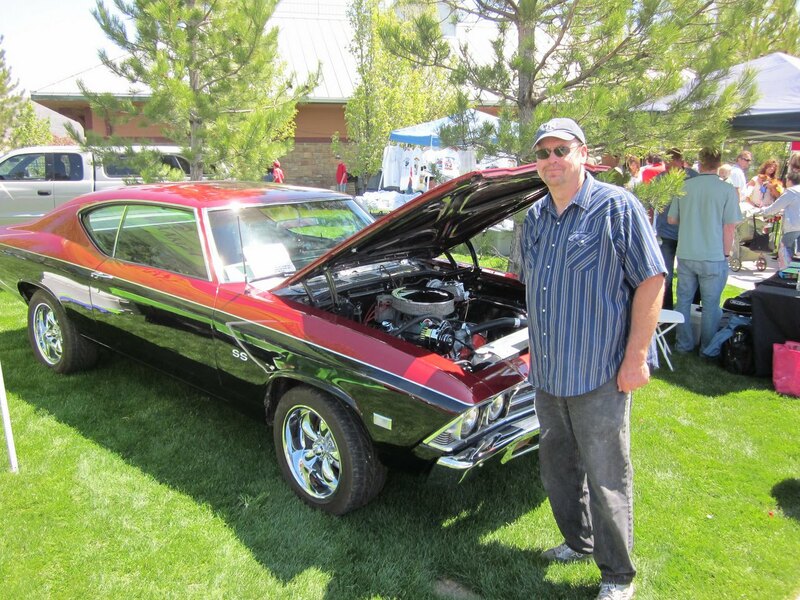 This is Joe Horvath's 1963 Chevy Nova SS.. Its a sweet car.. If only I had a 4 car garage.. heh heh.. 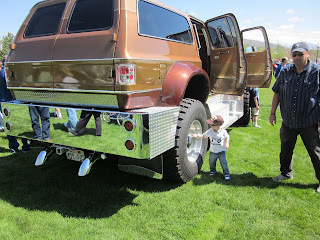 This was just odd.. A Suburban on a semi chassis.. 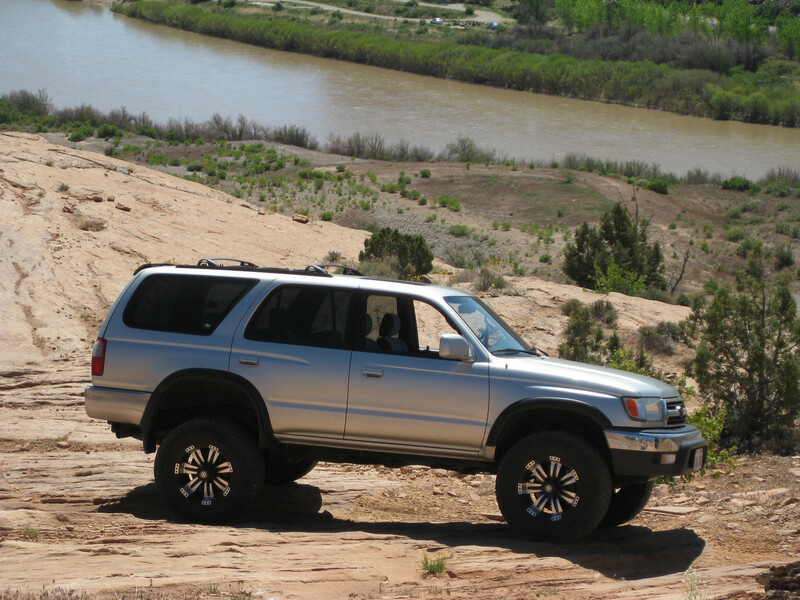 The "Ultimate Mormon-mobile" LOL! Logan and Grandpa hanging out looking at the trucks.. Logan was all smiles! This is a 1950 Chevy pickup.. This was a really nice restoration.. Really nice. By the time we finished, Zach was tuckered out... 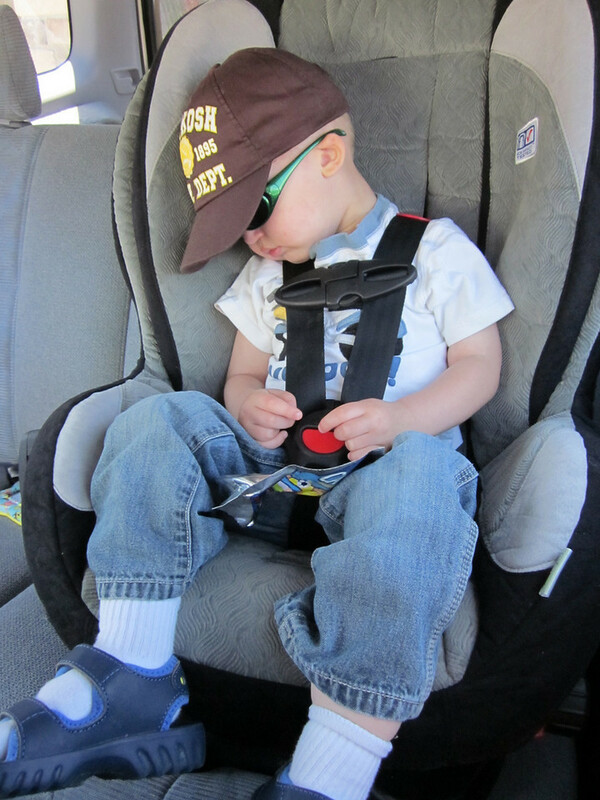 Almost as fast as we had him buckled in, he fell fast asleep.. Sunglasses and all.. What a great day!